Kids can spend hours racing around the rink at Wheels Skate Center. Add to the fun by teaching them fun roller skating games they can play! It’s safe to say that your kids will especially enjoy some healthy competition with their siblings on wheels. View our fall skate hours! 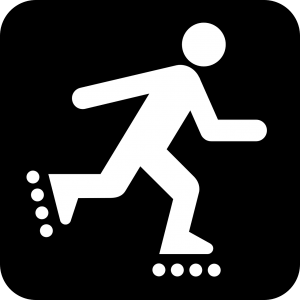 Check out three of our favorite roller skating games, then come skate with us! Everyone likes healthy competition, and kids are no exception! Bring your kids to our skating rink and let them race each other around the rink. Time them on your phone so they can see how fast they can skate! For extra fun, encourage them to beat their own personal record. This great game gives great exercise and can be done individually. Everyone likes classic charades, but add some wheels and everyone will love it! Appoint someone as the “creative mind” who tells each child what to act out. (Fun ideas include celebrities, animals, and objects!) As the child acts out, the other kids can guess what he or she is. If they get it wrong, they have to do a lap around the rink! This classic game is fun anywhere you go, but your kids will especially enjoy it on wheels! Appoint one person as the “tagger” who chases the other kids. If the tagger touches someone, that person becomes “it!” This game will give them a great workout while having a blast. There are many more roller skating games perfect for a day at the rink. Everyone will have a great time and make memories for a lifetime! Bring your family to Wheels Skate Center today for a fun family outing! Do you have questions? Feel free to contact us today.